Not Eating Enough: The #1 Mistake for Fat Loss! Have you ever found that even when eating a low calorie diet, you still struggle to lose weight or even start gaining body weight? In order to lose weight you often need to eat MORE calories not less! This is a difficult concept to get your head around – it doesn’t appear logical at first! A low calorie diet will work for weight loss but only for a limited period of time – it’s not as simple as less food means more fat loss. Eventually, your body will go into starvation mode to prevent you from losing any more body weight because it literally thinks you are dying! This article explains why this happens and how to maximise your fat loss. 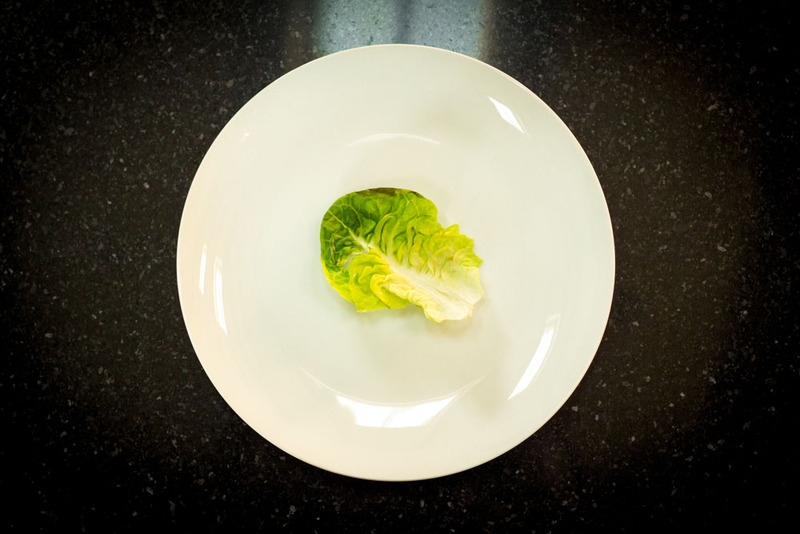 What Happens When You Don’t Eat Enough? If you imagine your body needs 100 units of energy per day, over 70 of these are needed to maintain your vital bodily functions and keep you alive, 10 are needed for digesting your food and 20 are left for exercising. When you don’t supply your body with enough energy, all of these processes are affected – the example below should explain how. Mary is feeding her body the 100 units of energy that it needs and everything is great – she has lots of energy, smashes her workouts, recovers well, has a high metabolism and is sustainably losing body fat by exercising. Katie on the other hand is only feeding her body 70 units of energy and things are not going so well – she has no energy, feels sluggish in the gym, has aching muscles, is losing muscle mass and her fat loss has stalled completely! How Does Eating More Lead to Fat Loss? In order to convert stored body fat into useful energy, your body needs to be functioning well. It can only do this if you supply it with enough energy from food. The example below helps to explain how this might work. 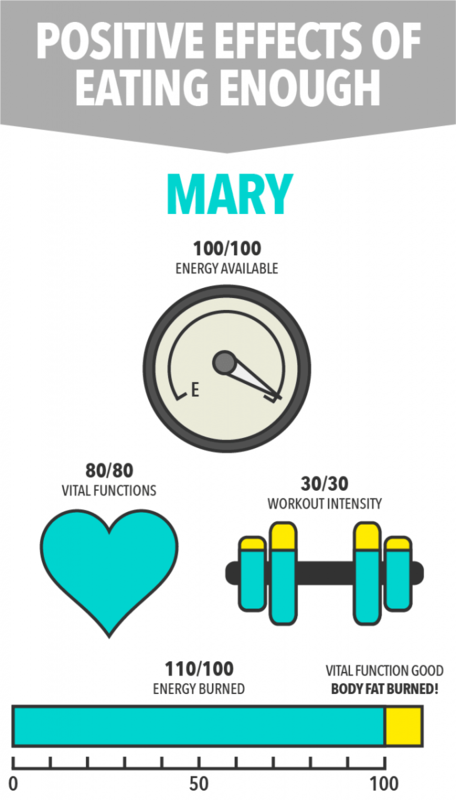 Mary has 100 units of energy to play with and uses 80 units of energy to stay alive and digest her food – plenty for her body’s needs and to be healthy. Her training programme calls for 30 units of energy per day. 20 of these will come from food and another 10 will come from her stored body fat! Because her body is functioning efficiently, it is able to convert stored body fat into useful energy and burn it off. Mary feels good, both mentally and physically, and is losing weight too – bonus! 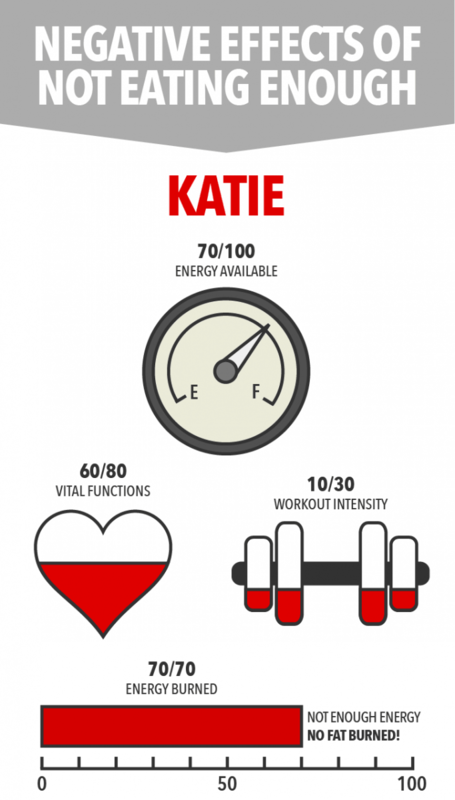 Katie only has 70 units of total energy as she is eating less. She is only using 60 units of energy to stay alive and digest her food, when ideally she needs 80 units, so her body is not functioning at it’s best. This is because her training programme also calls for 30 units of energy per day, but she only has 10 units left from food. As a result, Katie cannot convert her stored body fat into energy that’s burned it in the gym because her body is not working efficiently. Overall, Katie will not perform well in the gym and not burn any body fat! So Mary is eating more calories and as a result she is losing more fat, getting stronger and she feels great. It may seem counterproductive but what Katie needs to do in this situation is increase her caloric intake to enable her body to function at it’s best and then it will start burning body fat. 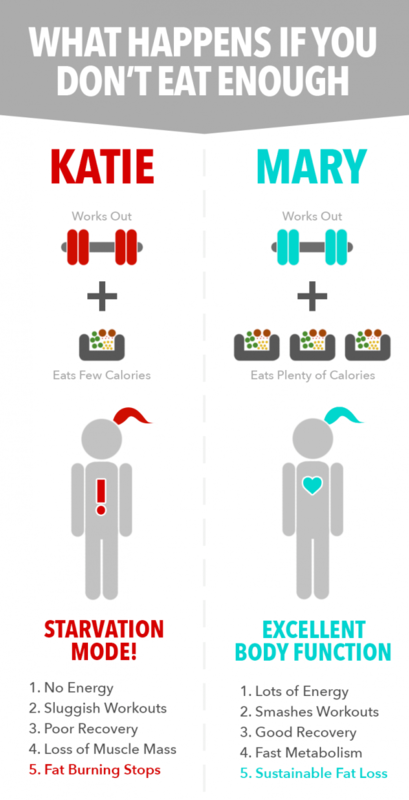 Hopefully you will now understand why we might tell you to eat lots of calories when starting out on our training plans. When you eat and train properly, your lean muscle mass will increase and because of this you might not see a huge change on the scales, even though you are losing body fat. By eating the right amount, you won’t suddenly start piling on body fat – you will end up looking better than ever!